Those of us who share our homes with birds understand how highly intelligent they are. Scientists have proven that the emotions of a bird are at least as complex as those of a 3 year old child. It’s up to us to see that we meet all their needs and to keep them physically and emotionally happy. Here are some common sense suggestions to help make sure your feathered friend remains content for many years. 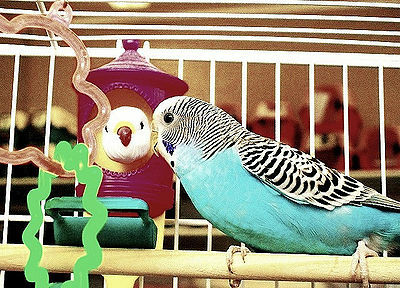 Make sure your bird gets enough exercise both physically and mentally. There are lots of toys available today to stimulate your bird’s interest and keep him/her moving. Vary your bird’s diet. Feeding a variety of fresh foods as well as commercial foods helps keep your bird healthy and supplied with the proper nutrition. Introduce new foods gradually and make sure beforehand that they are bird-safe. Spend time with your bird. 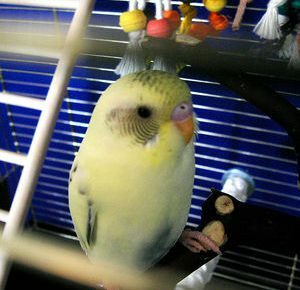 A great deal of your bird’s emotional health depends on the amount of time s/he receives from you. Set aside special daily play times. Your bird loves to hear you talk and some will even mimic you. Try training your bird to do tricks. My granddaughter taught her pet conure to sway and dance a bit to her antics. Fun for him and a joy for all to watch. Make sure the cage is the appropriate size for your bird. When purchasing the cage, consider how many accessories you plan to include. Choose toys that are safe and the right size for your type of bird. Remove some of the old toys to introduce new ones every so often to keep your bird interested. Following these few simple suggestions can make for a very happy, healthy companion for many years.